If you have been involved in a car accident in the State of California and you are thinking about bringing a personal injury lawsuit, there are time restrictions to do so. 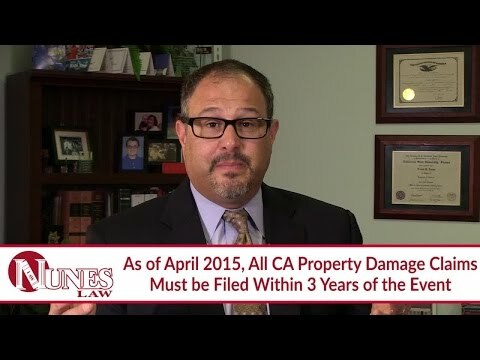 As of April 15th, 2015, in the State of California you need to have brought the suit involving personal injuries on or before the second anniversary of the injury-producing event. This means that you have two years from the time of injury to bring your claim. In regards to claims involving property damage, you are allotted an additional year, so you have three years to bring property damage claims. However, time limits for injuries involving public entities or public property can be as short as six months. Please note that the limits are subject to change, and the times provided here are valid at the time of writing. It is important to confirm the current time limits with an attorney. If you have additional questions or if you would like to discuss the current time limits to bring your lawsuit, I want you to call me at (559) 436-0850. I welcome your call. Visit our educational website at www.NunesLaw.com, where you can view more videos and media content from our law firm.